We spent a wonderful week cooking for an Australian family, and we are sad to say good-bye to them. Hopefully our paths will cross again, maybe in New York. They are a very special family, who understand the value and pleasure of spending time together. After slicing the potatoes, rinse them in cold water a few times to eliminate the excess starch. Keep the slices in a bowl of water as you assemble the other ingredients. Use whatever cheeses you have available, don’t use anything too wet, like a mozzarella or the torte will be too runny. I think an all gorgonzola torte would be spectacular! Bring a cup of milk just to the boiling point and then turn off the stove. There, now you have scalded milk, which in theory, will now not bubble up in the oven and make a huge mess. As an extra precaution, use a deep baking dish and only bring the potatoes up to about the ¾ mark on the dish. To facilitate getting the whole thing out of the pan, line your baking pan with parchment paper, and then you can lift the torte out of the pan when it is done. 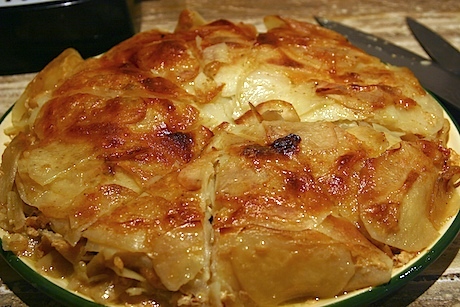 Pour a tiny bit of olive oil in the bottom of a baking dish and start layering the slices of potatoes, onions and cheese. Add a bit of salt and pepper to each layer and a tiny bit of oil every two layers. Finish with the grated parmigana and a dusting of nutmeg on top. Bake at 325 for at least an hour and a half, remove when the potatoes are soft and the top is brown.